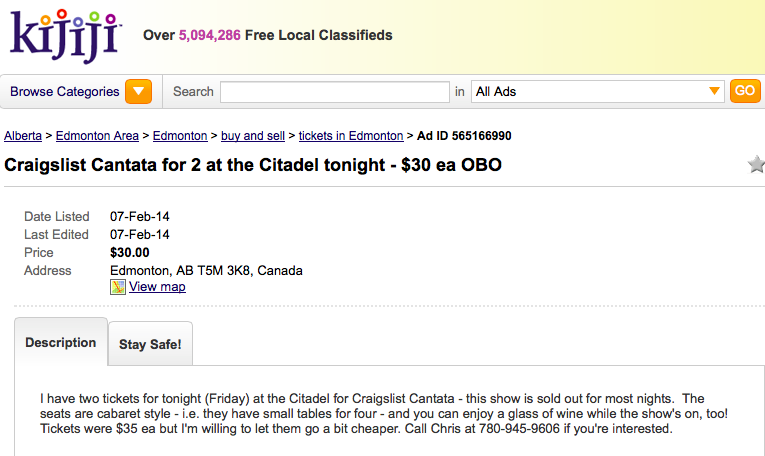 The Craigslist musical is still running in Edmonton for another week. It had a great run in Calgary with the High Performance Rodeo and Alberta Theatre Projects and now it ‘s being shared with audiences in the Club at the Citadel. Bill Richardson gave an interview with the Edmonton Journal where he mentioned that an AD had said that Winnipeg was more of a Kijiji town. In fact, I think Kijiji is actually more popular than Craigslist when Canada is taken as a whole. I think this actually make the show more authentic and special. Kijijij is owned by Ebay as a Craigslist competitor. Everywhere that the show has been now, the audience has come out in droves and embraced it. We’d love to be able to bring the Craigslist Cantata to all the Kijiji cities out there. Previous Previous post: Year end round up 2013. Next Next post: Games previewing tonight.